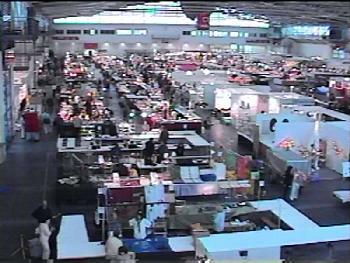 This is a 5 day show report for the 2000 Munich Show which I visited from October 4 through the 8th. Day - 1 - I arrived at the Show at 10:30 am on October 4th after taking the U-Bahn (underground subway) to the Messestadt West station. Like last year getting to the show from just about anywhere in the city of Munich is quite easy with the well run and kept subway system. When I got into the halls I found that the vast majority of dealers were still in their vehicles waiting to get into the two exhibit halls that were available this year. Kind of hard to believe that in 24 hours from the time the pictures were taken that there would be a complete transformation of the show area from what you see below to the jammed packed hustle and bustle seen further below. 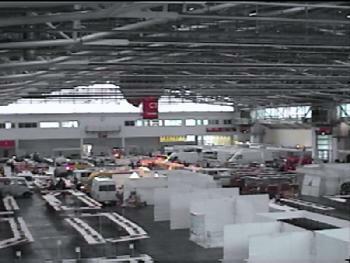 Overview of Hall C1. There was a nice area to get a vantage point view of the entire Hall C1. These shots were taken during the set up day on October 4th. The show has been kind of squeezed this year due to scheduling problems with the available halls. The result is that the show is in just two halls this year instead of three like it was last year and it comes only 3 weeks after the Denver Show. 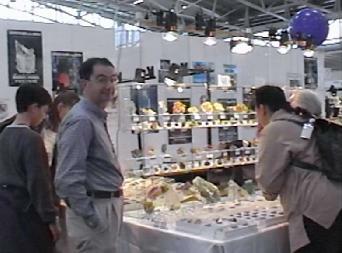 It turns out that the Halls were only available for the show this year only 2 days after the end of the Oktoberfest and that there is a large bakery convention using 5 or 6 of the available halls for their show - including one of the halls used by the mineral show last year. 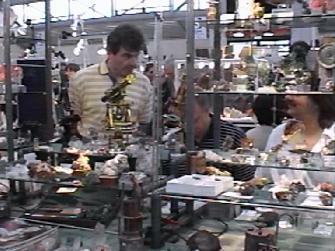 I suspect that there are more than just a few dealers who exhibit at both the Denver and Munich Shows that have felt a bit stressed by the timing of the Munich Show so soon after the Denver Show. 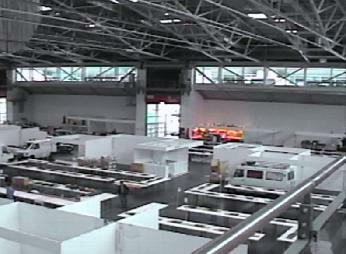 It will be interesting to see how crowded the two available halls are with collectors this year... 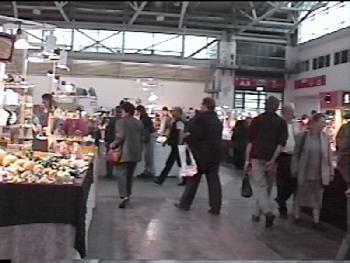 It should be mentioned that the halls are enormous and do provide space for many dealers. Each hall is larger than the floor space at the Main Show in Tucson at the Convention center so it is the equivalent of two main shows at Tucson! 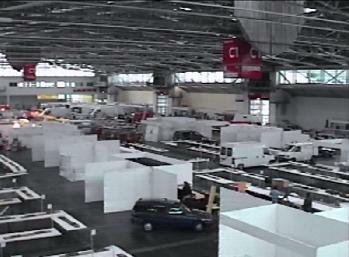 Here is a view of Christian and Petra Gornik (German dealers) setting up on the 4th in Hall C1. from Tsumeb and tourmalines from Brazil. Though the vast majority of the floor space in Hall C1 & C2 were still empty I did find a few dealers who had their specimens out or available for viewing. I stopped by Christian & Petra Gornik's booth while they were setting up and saw where they had some of the fairly new aquamarine specimens from Namibia (there are a very large amount of these currently just as there are Chinese pyromorphites). He also had some nice specimens from Tsumeb which I picked up for the Tsumeb.com site. Many of the Moroccan dealers were already set up and there were a large number of them with erythrite, vanadinite, azurite, wulfenite and other species associated with the localities from there. VERY few of the erythrite specimens were free of damage. I visited every dealer in Hall C1 and found only a small handful of specimens that I was willing to pay for. It is clear that the best group of erythrites from the new find were brought to the Denver Show and that François Lietard, a French dealer, had the best of the lot of the new material. I am anxious to see what he may have available when he opens up later tomorrow. Of course, tomorrow may prove differently regarding the erythrite specimens but there is no indication that there are substantial amounts of the new erythrite specimens that were introduced at the Denver Show. Elsewhere in Hall C1 I found a Moroccan dealer who had a hoard of decent wulfeniteTNs and miniatures that we worked out a deal on. Nearby the Moroccan dealers was a Turkish dealer who had a large number of Kammererite specimens. Again, the majority were a mess with damage but I did find a few including one specimen with very large crystals associated with calcite and white asbestoform chrysotile. Across the Moroccan zone in Hall C1 I came upon World of Gems - a Russian dealer - who had a number of fine crocoite (with and without pyromorphite and vauquelinite) specimens from Berezoeff which is the type locality for the species. These are from a new find made this past summer at the locality. Most people who've seen these have not seen this high a quality of specimens from this locality in years. Also in Hall C1 Schmitt Minerals had a fine specimen of fluorite from Dal'Negorsk. 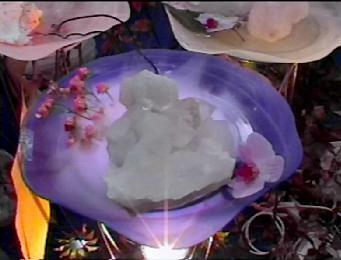 A very fine water clear single cube on matrix. Phalabowra, Transvaal, South Africa being among the finest known for the species. Also in Hall C2 I found Italian dealer Marco Bernardeschi who had some fine matrix specimens of topaz from Katlang, Pakistan. Across from Marco was Christian Rewitzer Minerals. Christian's always got some very interesting specimens available - including a large selection of rare species and specimens from Pakistan and Afghanistan. I found a variety of good pieces there including a German phosphophyllite, carletonite, brucite, and several others including purported Feinglosite. I left the show at around 5pm and headed back to my hotel room located near the English Garden district of downtown Munich. Later in the evening I met Knut Eldjarn - a friend and field collector from Norway - who was in town for the show with his wife and son. We had supper together and generally had a good time telling stories about mineral collecting trips. 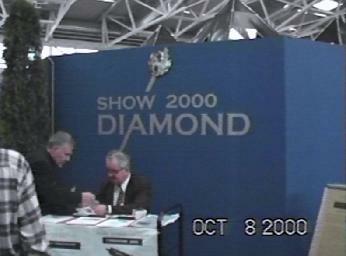 On day two, October 5th, I arrived at the show around 10:15 am. I immediately went over to Mikon Minerals in Hall C1 where they had a new find of lead minerals including wulfenite, mimetite and cerussite, from Iran. Mathias had warned me the day before that these would be popular and true to his word when I got there I found USA east coast dealer Ernie Schlichter busy looking the specimens over. He took a couple of the wulfenites and I dealt for the rest of them. New material from Iran is rarely seen unless it is brought to market by people who aren't citizens of the United States due to political differences. There were also a few interesting specimens of wulfenite and mimetite pseudomorphing descloizite(?) also from Iran. I took what I thought to be the most interesting specimen. They also had an interesting specimen of amethyst sceptre quartz from Maize, Madagascar which I bagged for the website. getting his booth set up for the show. I then headed to Hall C2 to visit with Gilbert Gauthier who always has some very fine uranium bearing minerals from Katanga and Europe. I spent an hour or so opening flats and making selections of fine "hot" mineral specimens. Gilbert always has some interesting specimens of uranium bearing species. 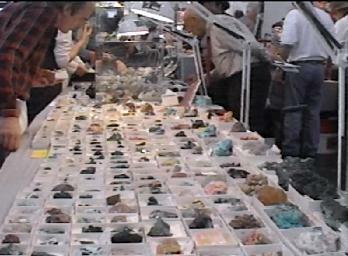 the more interesting mineral specimens at shows - especially with his usual assortment of radioactive species. Next I wandered over to Jordi Fabre's booth and saw where he had specimens of a new find of green smithsonite from the #9 pit at Touissit, Oujda, Morocco. 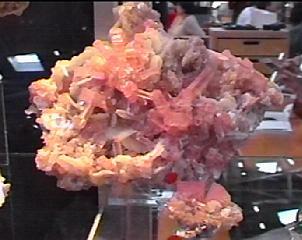 He was not sure if the smithsonite was colored due to copper but the other possibilities seem slim. He also had some nice new lustrous specimens of crystallized prehnite with clinozoisite from a new find at La Cabrera near Madrid, Spain. Here's a shot of Jordi Fabre on the left and a shot of Julia Elena Van Gelderen de Mittermaier - Jordi's assistant. not pictured here. His name is also Jordi. Clive Queit had a large number of the aquamarines from Namibia also as well as his usual array of fine specimens from the Kalahari and quartz from Brandburg. This year he brought a few small flats of rarities from Namibia like jeremejevite and other rarities from Tsumeb including 7 specimens of minrecordite with dioptase. 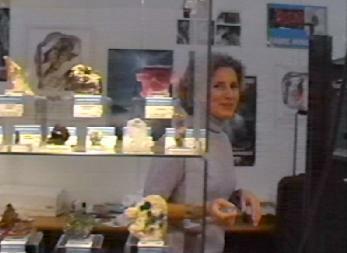 when you get distracted looking at minerals and forget to turn the video camera off. A superb view of the ceiling! That evening I had supper with Swiss dealers Laurent and Christine Leisi - a couple of friends who live just outside Geneva, Switzerland. We had a good time exchanging stories about the minerals we'd found that day at the show and made plans to meet again in June in Switzerland prior to the Ste.- Marie aux Mines Show held in France. 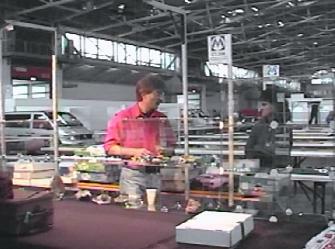 On day three I was met by Uwe Liebich who had contacted me prior to the show to see if I was interested in some specimens of uranocircite from Germany. He had a small hoard of self-collected pieces with him at the show and I made a selection of 10 specimens. Pieces that are thumbnail and miniature sizes. Later I wandered back over to Hall C1 and found a Russian dealer - Kamen-Talisman - who had a couple of specimens of the famous rheniite. I say famous because the mineral hat not yet been approved by the IMA due to what can best be described as egotistical differences. 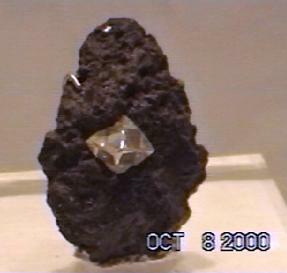 Other characteristics which lend fame to this species is that it is the only known naturally occurring mineral containing the rare element rhenium. Lastly, the deposit where it was originally found is on the side of an active volcanic vent. Rheniite is rather volatile and easily sublimated. After the initial group of specimens were collected the vent "plumbing" changed and literally obliterated the deposit through sublimation. Other specimens that I picked up from Kamen-Talisman were some specimens of zircon from Kola, Russia also that I picked up. While visiting the booth I ran into Dmytriy Belakovskiy who is the curator at the Fersman Museum in Moscow. Dmytriy usually attends a variety of shows in the United States including Tucson, Denver, Costa Mesa and Springfield. 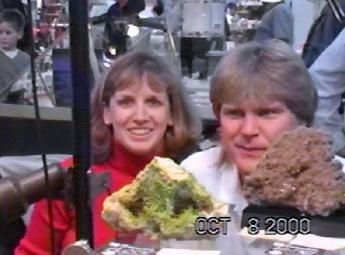 He deals a lot in rare minerals species and his identification of minerals is impeccable. Here's a shot of Dmytriy in front of the Kamen-Talisman's booth. Next I visited with Dr. Jaroslav Hyrsl - a dealer from the Czech Republic - who always has a very interesting array of rare species. I found a couple more specimens that he had of the very rare native element compound of Rutheniridosmine. This is a very rare mineral comprised of the platinum group metals: ruthenium, iridium and osmium. 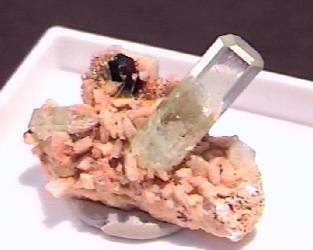 I also found several other specimens that will find their way into the Rare Minerals website. Jaroslav also sets up shop at the Executive Inn in Tucson each year so if you're in town for the show it's well worth the time to stop by and see what he has. Jaroslav also had two specimens of danburite from a new find made in Iran this past summer. He said that some Czech collectors had found 9 specimens of what they thought were light blue topaz. 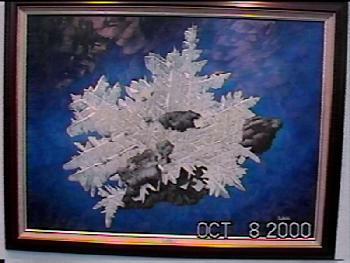 Once presented to Jaroslav it was quickly determined that they were not topaz but rather light blue colored danburite! He said that these two were the only specimens with well defined crystal form. 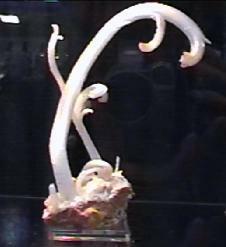 The danburite formed in an anhydrite deposit and was very limited according to Jaroslav. When I asked if he expected to see more of these he was quick to say no. 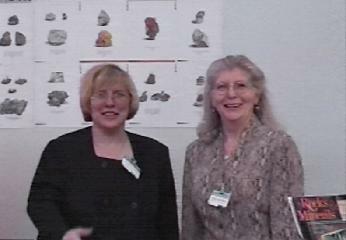 the Managing Editor for the periodical Rocks & Minerals while Ludmilla is the publisher of the Mineralogical Almanac. I had lunch with Ian Bruce and Simon Brock to discuss progress with the workings at Tsumeb. 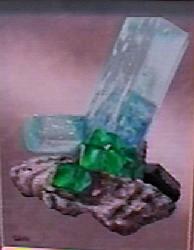 The blasting has started on Level 4 of the mine and a 2 meter wide vein of solid cerussite with malachite was encountered. Another area on the level was found to have azurite exposed on the vein strike. They've drained the water out of the mine down to the 11 level. There is also a lot of muck left in the mine as the mine was backfilled with tailing during the last several years of the mine's operation. It is creating quite a challenge to get the debris out of the way to get at the workable mineralized zones. The operation is not at all like visiting the local supermarket where one can select what they want at will. Hence, it would be totally erroneous to assume that new specimens from the mine will be inexpensive. Regardless, it looks like something new from Tsumeb will be making its way to the the collecting world in the not too distant future. Back in Hall C2 I picked up an interesting specimen from Spanish dealer Luis Miguel Fernandez Burillo of amethyst with pyrite from a new find in Turt, Oas, Satu Mare, Romania. I saw quite a few of these around the show but I was late in recognizing them as new material. Most of what was left was pretty clunky looking so I passed on all but the one specimen. Hopefully, more of these will become available over time. He had several others but this piece had the best color and aesthetics of the group. I also found a very well crystallized and color zoned specimen of fluorite from China among his available specimens. That evening I had a supper with Spanish dealer Jordi Fabre and we discussed many items about the show and future of the mineral hobby with the Internet. Unlike my culinary experience with Jordi at Ste Marie in France back in June this was more of business supper with pizza and a couple bottles of Munchener Bier. It still was quite delicious. On day four I spent most of my day visiting with other dealers there at the show including François Lietard who had what was left of the specimens of erythrite that he brought to Denver. He also had some very fine specimens of roselite as well. I sifted through the rest of his inventory of erythrites looking for good specimens and found ten fine specimens. I have to reiterate here that this appears to be a limited find. There were lots of dealers from Morocco with specimens of erythrite from the new find but the vast majority had lots of problems with damage. François clearly had the best of these specimens available at Munich and at Denver. Everything I heard when I asked was that this is it for the really good specimens. Of course only time will tell. François Lietard had some very interesting specimens available besides the fantastic erythrites and roselite specimens. they were sisters!!) and François. Near the western end and in the center of Hall C2 I found Martin Minerals who had a number of fine specimens of Fizelyite pseudomorphed by Boulangerite from Romania. 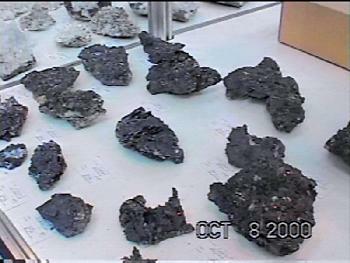 This new material was originally thought to be fizelyite but turned out to be boulangerite. That is not necessarily bad - just not as good as if it were fizelyite. Martin did have some legitimate specimens of fizelyite which are also found in the rare species page. Other dealers with some new eastern European material had some of these but Martin by far had the best assortment to choose from. Here is a picture of most of the new boulangerite ps. fizelyite material that was available at this show. I left the show early that day but before doing so came across an interesting and attractive item - various colored glass bowls with large mineral specimens (mostly quartz) in them resting on a small stand. Water filled the basin and some sort of apparatus was emitting a mist sort of like dry ice would. They were really quite appealing. I can not recall who had them unfortuantely. 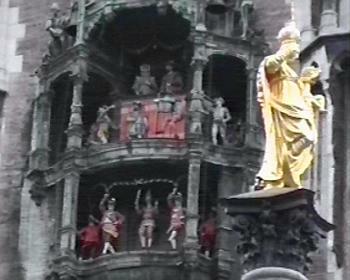 After leaving the show I went into town to see some of the sites such as the Rathaus at Marien Platz. 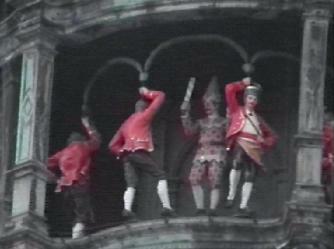 The Rathaus clock is world famous with its moving figurines. They are actually life sized. At 12:00 noon everyday the clocks in the 3-4 block area go off with a chorus of gongs. About 5 minutes after the stroke of 12 noon the upper level figures go around in two complete revolutions. Then the lower dancing male figures twirl as they go around in a circle. It really is quite interesting to watch. 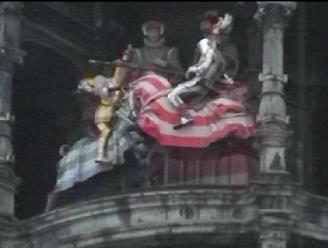 is of the two jousting figurines with the figure on the right falling back after the staged "hit". 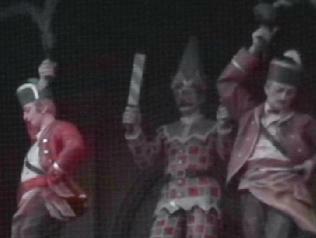 Here is the lower level figurines in traditional Bavarian costume. The detail of the figurines are readily evident in the photos. Later that evening I headed back out to the Messe for a supper with German dealers Siegbert (Siggy) and Karin Zecha. We ate at the Hotel Bauer which is located close to the show in Feldkichener. I expressed my desire to have a dish that was representative of the region and Karin suggested the Pumpkin Soup and Pepper Cream Sauce Schnitzel with vegetables. One word can be used to describe it: YUUUUUMMMMMY! On day five I spent most of the day wandering about and viewing the many displays of mineral collections and displays centered around the Show's Theme - Diamonds. Some of the diamonds were incredible. 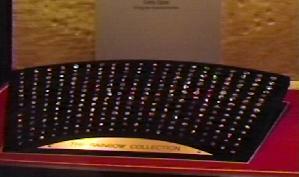 I could not determine if the diamonds on display were real or facsimiles as many of them were HUGE! Though I am not a diamond fan per se I am also not a fool when it comes to the value of such items. 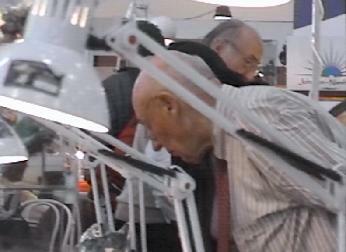 There were many genuine diamonds presented - both as cut stones and as matrix specimens. I personally like the matrix specimens the best. found all over town advertising the Munich Show. 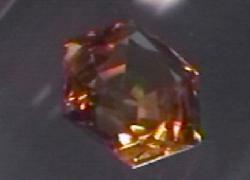 Here are two of the dozens of large colored cut diamonds that were on display. The blue stone is 40.68 cts and the amber stone is 36 cts. 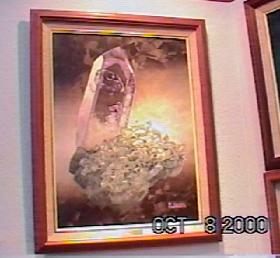 the right is from South Africa and has a 1.6 cm crystal of gem quality diamond on kimberlite matrix. I also spent some time viewing a featured artist Ranier Jackle from South Africa who had about 20 oil paintings on display. The three below are all from mines in Namibia. I later was wandering around Hall C2 and came across Fiedrich August Becker's booth and saw where he had these gorgeous carvings. Actually, Marty Zinn had pointed them out to me after lunch the day before but I finally took the time on this day to get a good look at them. These are absolutely beautiful! 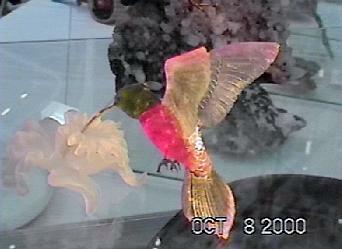 The first one is a tourmaline carving of a hummingbird. 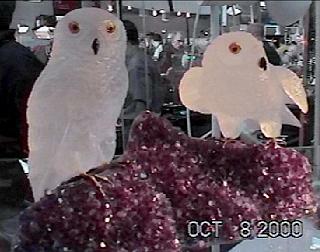 The carving on the right is of two owls carved out of white quartz perched on amethyst. 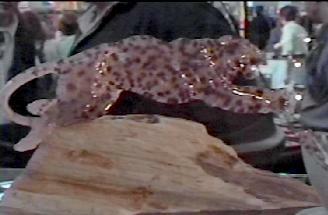 The last carving featured here is of a leopard carved out of spotted agate. On the final day of the show I ran around gathering some pictures and visited with other folks at the Show. I strolled by E.N. 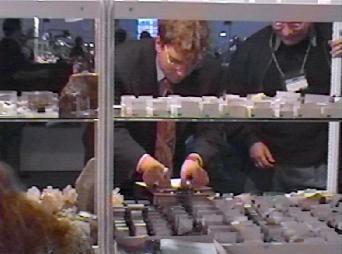 Stotzel's booth and found a fine specimen of fluorite from Wolsendorf. Working the booth with him was Gloria Fast from Jeff and Gloria's Minerals in Connecticut. Here's a shot of Gloria Fast (Jeff & Gloria's) with E.N. Stozel. Over in Hall C1 I found Hanspeter Schleife where I was surprised to find a nice assortment of Hauyne specimens from Eifel. He had a very nice array of cut hauyne stones also but my focus was strictly on the matrix specimens. Later in the day, as I was saying good-bye to people Siggy asked me if I was interested in offering rare specimens of Labuntsovite from a new find made recently in Kola, Russia. One look was all it took and then they were transferred to my carrying case. These are some remarkable specimens of this rare carbonate species with crystals to 5 mm on some specimens! He also had some new specimens of native lead from a new locality in Sweden. Here's a shot of Siggy Zecha with some of the items he had available at the show. After having gone through all of the various specimens that I brought back I realized that there were enough specimens to warrant a page of Mt. St. Hilaire items. I found many dealers who had specimens from this famous locality and without realzing it I picked up a hoard of them. That evening I had supper with friends Dan and Mirela Balan from Canada. Dan has a passion for shooting lasers through minerals to see what happens. I recommend a visit to his Opalloid Experiment website. We ate a place close to where I was staying in Munich and had Weiner Schnitzel with an appropriate quantity of beer for Mirela and I while Dan settled for red wine. One observation about the European culinary experience that I haven't focused on - cigarette smoking. Smoking is a popular experience for many people in Europe. At the show, in restaraunts, just about everywhere. I realized just how much I appreciate the laws in California which prohibit smoking in places like restaurants and every other public place. Every culture is different and has to be respected of course. As a non-smoker and one who is easily affected by second hand smoke I just had to make adjustments. 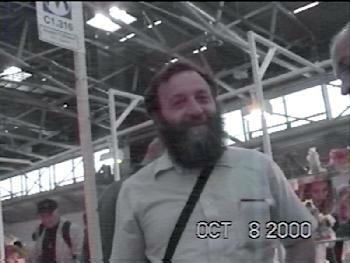 So overall I would say that Munich 2000 was an interesting show. There was not a real great deal of new material but considering how close in time this show was to the Denver Show it is not at all surprising. 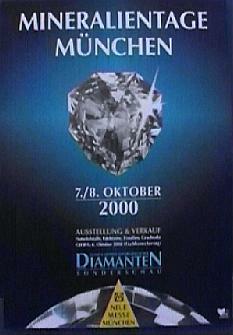 Regardless Colleen and I are already looking forward to Munich 2001 which will be held later in the month of October as it normally is. Wir sehen Sie das folgende Jahr von schönem München!